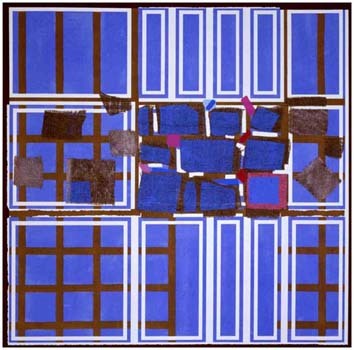 Despite her youth, Blow was at the forefront of the abstract art movement in Britain during the 1950s. Following her first painting sale, to Roland Penrose (a founder of the Institute of Contemporary Arts), Blow's career took off. Throughout the 1950s and early 1960s, she regularly exhibited with Gimpel Fils, the leading London gallery whose association with St Ives artists like Barbara Hepworth, Ben Nicholson and Peter Lanyon anticipated her move in 1957 to live for a year in a cottage at Zennor near St Ives. Blow was widely exhibited abroad throughout this time, establishing the international profile that her cosmopolitan outlook warranted. Participation in peripatetic displays of contemporary British art saw her work promulgated in Italy, Holland, Germany, the United States and later Australasia. 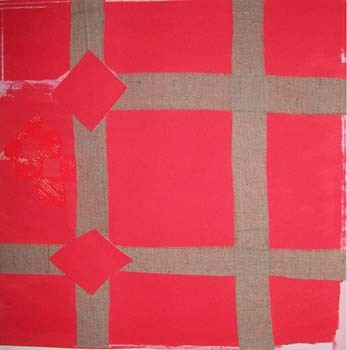 In 1960, having returned to the capital, Blow acquired a large studio at Sydney Close in Kensington, where she worked for the next 24 years. In 1961 she started a 14-year stint teaching at the Royal College of Art. Although painters like Jennifer Durrant, Gillian Ayres and Joan Mitchell shared with Blow ambitious scale and expressive dynamism, she stands alone as the earliest and most original woman painter in Britain able to challenge the bar-room "macho" cult associated with free, informal abstract painting. In moving to St Ives during the mid-1990s, Blow came full circle, reinvigorating a Cornish art scene bereft of the glories she had sampled 35 years before. She exhibited locally but also fulfilled her obligations as a Royal Academician, participating in every Summer Exhibition at Burlington House, where she enjoyed a retrospective in 1994 at the newly built Sackler Galleries. She died in 2006. All listed Sandra Blow prices are inclusive of VAT.